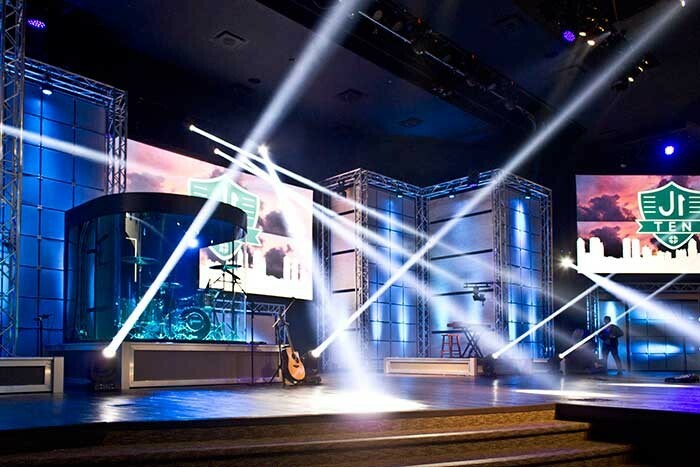 Florida - Ten Robe Pointes have been delivered to Christ Fellowship Worship Centre in Palm Beach Gardens, Florida, USA, specified by lighting designer Aaron Leahy who is responsible for all lighting designs and systems at the 1,747 capacity purpose-built venue. Christ Fellowship Worship Centre was established in 1984 and stages around four regular weekend services plus additional events. Leahy first saw Robe’s new Pointes at PLASA Focus in Orlando, shortly after the product – Robe’s fastest selling to date - was launched at Prolight+Sound 2013 in Frankfurt. He knew immediately that it was the "perfect light" for their venue. 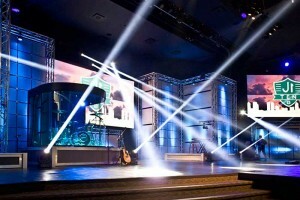 Following that, he discussed the matter with Nathan Carroll, director of live production, who oversees all Christ Fellowship’s technical aspects and arranged for the entire technical team from the Palm Beach Gardens CF campus to have a demo of Pointes at Infocomm 2013. Everyone was suitably impressed … and the order was placed. Robe was specified for a number of reasons. Leahy comments that Jerry Seay from Robe Inc’s sales team was extremely knowledgeable and helpful, forging a good relationship right from the start. Furthermore, Robe’s commitment to providing quality fixtures, maintaining good value and the in-house manufacturing in Europe was a huge plus. However, the most significant reason for the decision was the "sheer ingenuity" of the Pointe including its superb brightness in combination with Robe’s optical system and the company’s commitment to smaller-brighter-lighter fixtures. All of these made the Pointe "an all-round winner for us at Christ Fellowship". In the venue, the Pointes are positioned around the lighting rig, placed so all their features can be utilised most effectively, from the 0 degree beam effects to the linear prism and wash which are excellent as backlight. Leahy explains that the Pointes look striking when in full beam mode, but "that’s just the beginning of what we are using them to accomplish". He continues that the fixtures are creating a "whole new dimension" behind their house band and the stage floor. "The addition of just 10 fixtures has greatly increased the scale and impact of our services," he says. 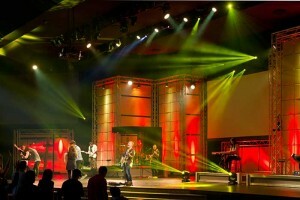 Lighting can be a key factor in building atmosphere and ambience during worship services. 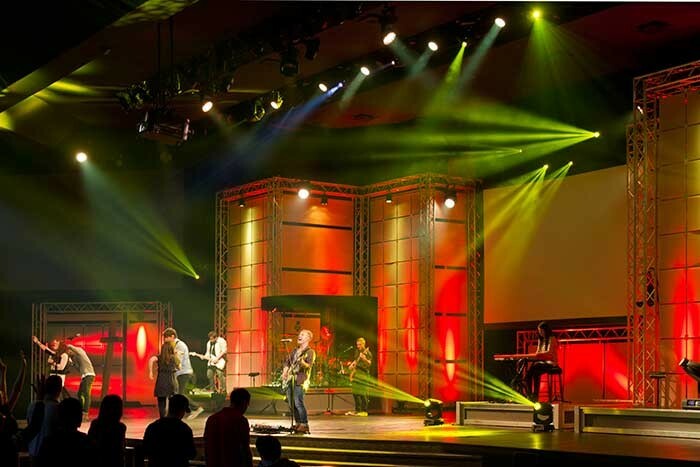 Having the Pointes – delivered via the Miami office of Stage Equipment & Lighting – is making a massive difference to the overall look and feel of the CF Palm Beach Gardens worship services. After the first event using Pointes they received numerous comments on the difference and quality of the service lighting - so the new fixtures instantly made an impression. Leahy himself usually operates lighting for most of the worship services and currently they have a Hog 4 console in house. He likes many features and functions on the Pointe – both the 0 degree Beam and the linear prism quickly became favourites. When in beam mode the Pointes "really shine" he states, adding that they would look equally at home in a large arena as they do in the Worship Centre. Dropping in the linear prism creates a fan like effect and rotating this makes a very unique effect. "The rapid movement of all the mechanics ensures near-seamless live transitions, adding depth and dimension to our stage," he affirms, adding that it’s "very evident" that Robe has a proper dialogue with designers and programmers when developing new fixtures. He concludes that not only is the ROBIN series extremely easy to rig and work with in a physical context due to the compact dimensions and light weight, but there are numerous other smaller but appreciable features, one being the Navigation System 2 with its large touch-screen and easy-to-read displays - "Making troubleshooting and patching a complete breeze!"